the psychopathology of everyday life - Adrian McKinty's blog: A Post Saint Patrick's Day Question: Where Did The Irish Come From? A Post Saint Patrick's Day Question: Where Did The Irish Come From? I won't draw out the suspense...the simple answer is Spain. I think the evidence is now pretty definitive that Ireland was populated from the Iberian peninsula fairly soon after the ice retreated at the beginning of the current Holocene Epoch. In the last five years DNA evidence has shown convincingly that from an Ice Age refuge somewhere in the current Basque region the original founder population of Ireland migrated up the Atlantic coast before settling along the Irish littoral. The great Irish neolithic monuments are the work of these people. But you don't just have to rely on the DNA evidence. A little noticed paper published in the journal PLOS ONE about snails also gives credence to this Spanish story. Apparently edible white lipped snails are found only in two places in Europe - the west of Ireland and the Basque Country. Scientists doing DNA research into these snails have concluded that they originally came from Spain and were carried to Ireland by migrating populations as a food source around the time that the first people also entered Ireland. All of this should be familiar to people who have read the work of historian Barry Cunliffe who has long spoken about an Atlantic civilization and ancient sea links between the British Isles, western France and northern Spain. 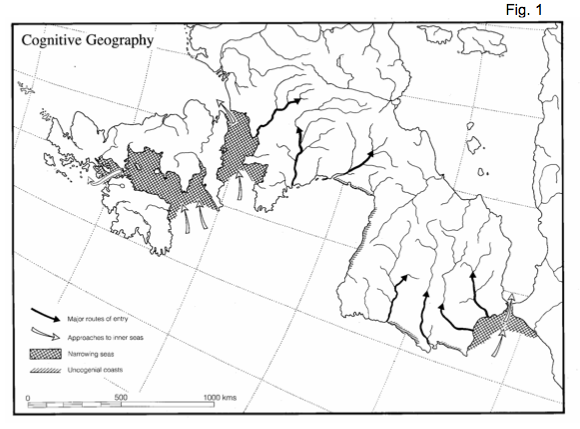 Cunliffe turns the map of Europe on its side and points out that the Atlantic and the rivers flowing into the Atlantic and the North Sea were the most efficient way for ancient peoples to travel in a Europe that was covered by dense forests. Cunliffe argues that rather than seeing the Atlantic coast on the edge of Europe (as we do today) we instead should see it - as Neolithic people saw it - as an important sea lane between cultures. I find Cunliffe's work compelling and I wasn't surprised to see it referenced favourably in Robert Macfarlane's The Old Ways. Macfarlane notes the similar folk traditions on the Celtic fringe of Europe's western periphery from Galicia to Orkney and speculates that it represents a unified culture connected by ancient sea routes that transcends the current temporary arbitrary national boundaries. If you're not convinced by the DNA evidence, the snails or Barry Cunliffe's Atlantic civilization, you could also rely on Irish mythology and oral histories (written down much later) that speak of the "Milesian Peoples" who apparently were the last invaders of Ireland. The Milesians were a dark haired civilization who came from Spain. Long discounted as completely fictional these "Invasion Myths" perhaps reflect a folk memory that goes back thousands of years when the first peoples from Spain arrived in Ireland not too long after the retreat of the glaciers. And who were these hardy Ice Age survivors? They were the descendants of the homo sapiens who first entered Europe about 40-50,000 years ago from Africa. The cave painters of Lascaux and Chauvet, the makers of bone flutes and the carvers of ivory jewelry and the Venus of Willendorf. People who'd entered a Europe filled with rhinos and lions, zebra and antelope, that didn't look that different from the place where they'd travelled from. So, ultimately, of course, the answer to the question of where the Irish came from is where we all came from: the savanna lands of The Great Rift Valley in East Africa.